It’s up to you, the department’s ace forensic investigator, to bring this reprobate, Ann Dercover, to justice – and to custody. The department is counting on you! 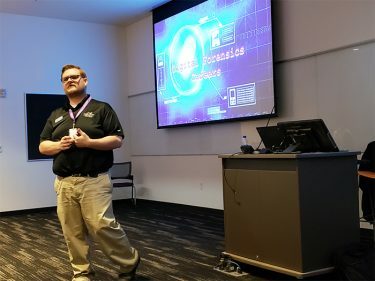 Such was the scene Wednesday in the Grand Canyon University Technology Building, where cybersecurity event specialist Eric Roberts laid out the mission for the high school students in the audience – one they chose to accept. 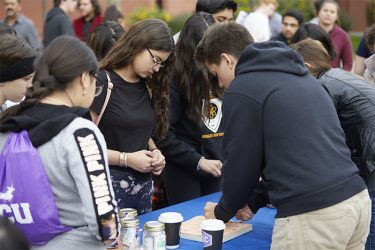 It was just one of the presentations in the University’s academic arsenal that GCU students and faculty unfurled for the popular Health Sciences, Engineering and Technology Day, presented by the Marketing Department’s ground event planning team. Via some gingerly executed computer hacking, Roberts challenged students to unravel Ann’s email address, her email password, her boyfriend’s email address and the items Ann told her boyfriend to bring with him to their rendezvous. Roberts launched into some of the tools forensic detectives use, such as Wireshark, what he called a “packet sniffer” – a program that targets packets of data transmitted over the internet (it can unravel coded emails, for example). “A hacker, on open wifi, can see pretty much everything you’re doing,” said Roberts, who advised the class to use a VPN, or virtual private network, to secure their data. Crime solved. Forensic investigator saves the day. He showed video of some amazing robot accomplishments: robots riding on bicycles, mimicking the movement of dogs, doing back flips and gingerly turning doorknobs. The robot turning a doorknob: “That’s a milestone,” Koeneman said. Then he showed an eerily human-looking robot called Sophia, who he said was made a citizen of Saudi Arabia, likely to give the project a publicity push. Melanie Mize, an administrator at Glendale Christian Academy, attended HSET Day – and the “The Robots are Coming!” session — with juniors and seniors from her school who expressed an interest in engineering and pre-med. “It (events like HSET Day) encourages them to have an open mind to all the beautiful things to learn out there,” Mize said of exploring different careers. 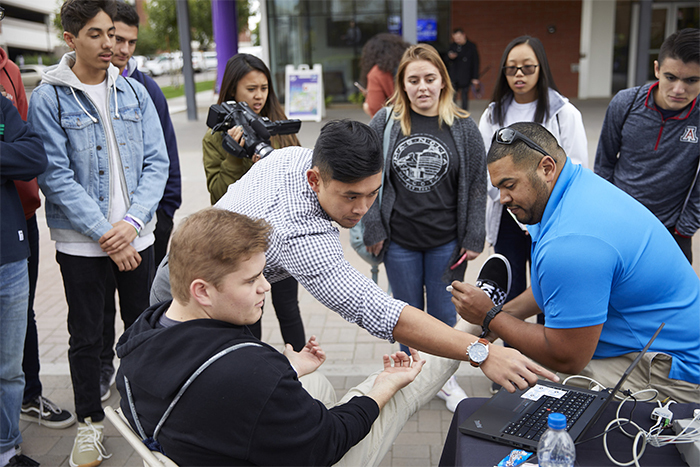 GCU senior marketing event planner Cara Jorgensen said introducing high schoolers to STEM careers is a focus for the University, which has put a lot of emphasis on STEM in the last few years. “The goal for GCU is to showcase the Health Sciences, Engineering and Technology programs. 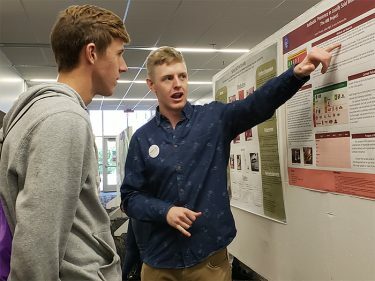 It is an opportunity for us to show all the different lab spaces we have to offer, for current GCU students to display their research through a poster display, and for GCU faculty in the programs to interact with prospective students,” Jorgensen said. Ana Acuna and Jiana Serrano, both sophomores at Bisbee High School, were in the Technology Building for the Exercise Showcase. It was where two pre-physical therapy majors, sophomore Payton Greer and senior Natasha Opoku, showed them equipment used for exercise tests, such as the spacey, egg-shaped Bod Pod, which measures body mass; a machine that measures pulse wave velocity (the stiffness of one’s arteries); and a machine that measures VO2 max, or how much oxygen a person is pushing out and breathing in. “A lot of Olympic athletes go through testing like this to see where they are (healthwise),” said Opoku. 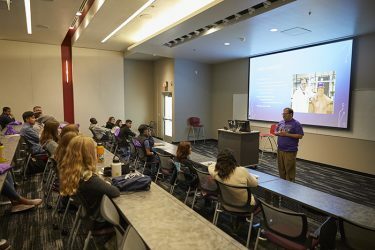 The equipment can be found in GCU’s Health Intelligence and Programming Clinic, which was started by the campus’ Student Wellness and Health Association. Acuna said her favorite part of HSET Day was touring the cadaver lab. Ninth-grader Mariana Soto made it to campus from Nogales High School. About 11 students from her school made the trip. Her favorite area, of course: the cadaver lab. “I want to be a pediatrician,” she said as she waited in line at the suture station, one of many booths outside that featured activities such as the Plyo Olympics (a plyometrics challenge) and magnetic Cubelets at the Robotics Club booth, where students could put together modular robots. Athletic training major Yasmine Dorsey, a senior, helped man the hydration and heat illness booth. “We’re teaching people how to properly hydrate themselves, not only in the summer but the winter months,” she said as she shared the knowledge she has learned in her time at the University. 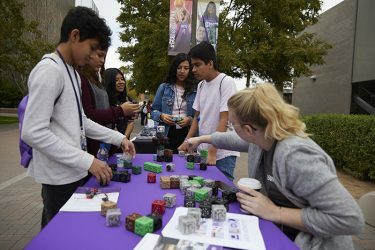 GCU’s chapter of the American Society of Mechanical Engineers displayed 3D-printed rocks and a laser-cut wood catapult to high school students along with circuits and a 3D-printed T.Rex. 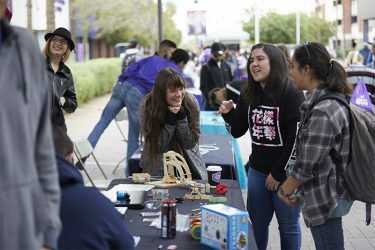 Junior mechanical engineering major Daija Rogers said the club wanted to show high schoolers all the neat things GCU’s mechanical engineering students are doing in the University’s labs. Nick Gee, also a junior mechanical engineering major, said it’s what he loves about GCU: seeing what’s written on paper come to fruition in the labs – not just theory, but application.